Rejection. It hurts. No matter what the size or severity, rejection is one of the biggest challenges to self-love. 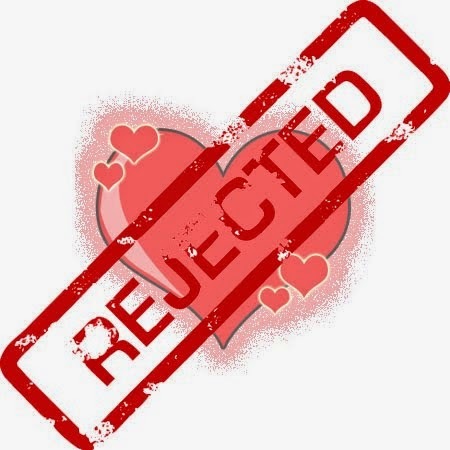 From not getting a call back after what you thought was a great first date, to not getting the job you thought you were perfect for, rejection triggers a dangerous dose of self-doubt. And it happens to all of us.One of the hardest areas to be rejected is romantic love. The suffering that comes with this type of rejection is considerably harder than in most other types. Interestingly, many people tend to love and desire those who aren’t as passionate about them. It seems like being rejected or merely fear of being rejected makes us more passionate about what we can’t have, making us suffer even more.So here we're going to share few ways to deal with it. Friends could be the most helpful person around you. Yes, we know you want to stay alone, but you need to know loneliness bring depression. Go meet your friends, talk to them. Do not become a silent viewer, participate and smile. It's tough to smile when you are upset inside, but Fake it till you make it. Yes fake your smile unless you learn back to smile on your own. It feels like discussing what is bothering you to your close friends, But don’t do that. More you talk about it, more you will think about it. Talk about it to your close friends once, twice but not more than thrice. Whenever your mind thinks about it, shut your thoughts then and there. Listen to music, cook, divert your mind with whatever you could. Stop feeling and thinking bad about yourself. Don't show any pity on yourself for whatever happened. Tell yourself, you are strong and you can get up back too. If you will pity on yourself, people will feel pity on you too. In Love you wish to be close to the person you love, even after being rejected. No, let your heart tell you 1000 reasons for still staying close to that person. You need to distance yourself, it will hurt, but it is important. If that person will be around you, the thoughts of rejection will never leave you. So part your ways right now. Enjoy company of singles, looking at couples will make you sadder and upset. Yes! Only for a while, you do not need to spend the rest of your life in the company of singles. Make a list of things you didn’t like about that person, or you hate the things most about him/her. That list will make you feel a little better, and will surely bring back your self confidence. You may have got things, S/he gifted you, or things that remind you of that person. Go and donate them to someone who needs them. You may go to an orphanage, pass them to street children or anywhere else. Join a Club, or a hobby class for a while. Meeting new people, getting new environment will definitely help you. Your mind will have new things to think about and to be happy about rather than things which will disturb you. Do not postpone it. When you first realize you are being rejected, you may be unable to speak and feel physically sick. Physical symptoms and other symptoms such as being unable to sleep, work and concentrate can persist for several weeks. The intensity of negative emotions will gradually fade, although you will definitely continue having good days and bad days. Little by little you will learn to enjoy your life again and will start noticing other available options.